The teaching and learning function of the Academic Advancement Network is focused fundamentally on teacher learning. Our goal is to directly develop the professional proficiency of our academic colleagues and enable them to better support the success of all MSU students. We provide dynamic and responsive educator development, aligned by shared language around teaching competency areas. Through alignment and with central support, departments and colleges can co-design consistent, fulsome, credentialed, rewarded and sustainable training in teaching and learning practice for educators across roles and disciplines. Learning Communities, formerly known as Faculty Learning Communities, are ongoing discussion groups that allow MSU colleagues to gather from across departments in order to develop their skills (and even create new resources) related to a specific teaching and learning topic. Additional campus events related to Teaching and Learning may be found on the Calendar. To schedule a consultation, observation, or feedback session, please complete this Online Request Form by following the link and signing into Google using your primary MSU NetID. 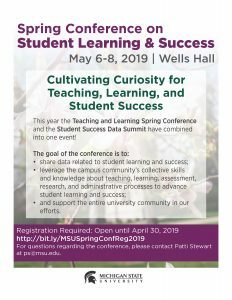 Each Spring, after classes have ended, we host a conference showcasing innovative teaching that happens across the campus of Michigan State University.